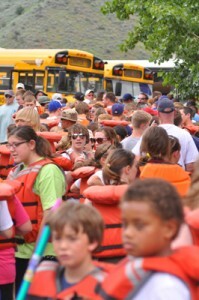 On June 28, 2011 over 800 Boise-area youths will be given the chance to float the Payette River with Police Officers during the 15th annual Police Raft Along. This donated program is a commitment from local business leaders to strengthen ties between young people and law enforcement. Cascade Raft and Kayak, with the help of many river-qualified volunteers, sets the stage for plenty of river fun and kid/adult interaction. In addition to the guided trip down the Main Payette River, the day includes a huge barbeque sponsored by American Catering and Nagel Beverage Foundation/Pepsi, the Boise Police Department’s Johnny Law rock and roll band, with the St Alphonsus Hospital’s Life Flight crew making a special noontime riverside fly-in. The goal of this community-wide effort is to provide an opportunity for these children, many from difficult backgrounds, to have positive interactions with authority figures (police officers, the raft guides and other adults) with the intention of changing their perceptions and building positive community relations for the future. Whitewater rafting is a remarkably successful means to accomplishing this goal. Kids, Busses, and Life Jackets!